Hindi Film Joker is featuring Akshay and Sonakshi again in the lead roles after Rowdy Rathore. Movie will release on 31st August, 2012. This movie directed by Shirish Kundi and produced by UTV Motion pictures, Three’s Company & Hari om entertainment. And sound track of the film music given by G.V. Prakash Kumar. 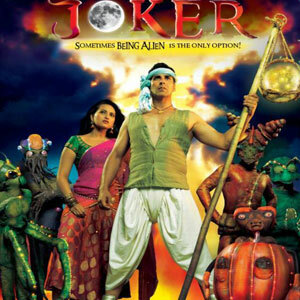 Joker is an “out of this world” Hindi comedy drama adventure film; I think this could well be a big hit like Rowdy Rathore. The shooting began of the film on 14 February 2011 in Chandigarh. Joker is reportedly Akshay Kumar’s 100th film. Sonakshi will also perform an item number in the film. The theatrical trailer release is scheduled with the release of the movie cocktail. The trailer get idea of how formulating the character of the movie and how to executing in to worldwide media. The story is about an NRI (Akshay Kumar) and his beautiful wife (Sonakshi Sinha) who returns home to discover that their village has dropped off the map of India. And make biggest drama and comedy the universe has ever seen. Akshay is best and yes it definitely, Akki back on track. It is heard that its previews have garunted a lot of praise from the distributors and that’s why it is release has been advanced to cash in on the recent success space of Khiladi Kumar.